Aikikai Hombu There are 3 products. The 10th international Aikido congress vol. 1 Language : Japanese 101mn The IAF (International Aikido Federation) organizes an international congress every 5 years. 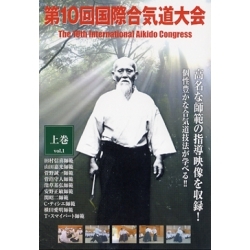 The 10th international Aikido congress vol. 2 95mn Language : Japanese This event was held in 2008 in Tanabe, a city in Wakayama Prefecture, the birthplace of the founder of Aikido, Morihei Ueshiba.The IAF Congress is the largest Aikido Congress in the world.